A love of sports and a love of gambling are two things deeply imbedded in Australian culture, and what better way to unite these two favourite Aussie pastimes than by combining sports into real money pokies. We’ve compiled a list of some of the best sports themed pokies that can be found at our recommended casinos, so players can experience the adrenaline of online gambling with the ambience of a sporting event. Not a sports fan? Not to worry – these games use engaging graphics and offer some exciting bonus features, making them suitable for those who don’t know their AFL teams from their NBA teams. Cricket Star belongs to Microgaming’s collection of sports themed pokies and while the graphics leave much to be desired, this is a firm favourite amongst Aussie players especially coming into the summer season. Cricket Star is a 243 way pokies game with scatter symbols, free spins, stacked wilds and a Wild Wickets feature which will randomly turn reels two, three and four wild to form a guaranteed win. If you’re not a cricket fan Cricket Star may be a little dry for your liking, but the additional bonuses definitely makes it worth a spin or two. 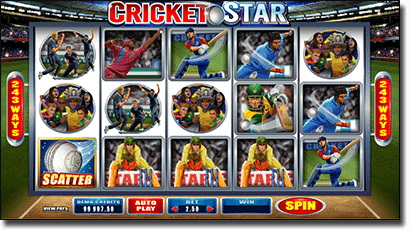 Play Cricket Star for free or real money bets at Royal Vegas Casino. Not what you’d expect when thinking of a sports themed game, Fisticuffs is a NetEnt production based around the bygone era of vintage boxing. Using Disney-like animation that tips its hats to the days of retro cartoons, Fisticuffs is made up of icons you’d find in an old city boxing ring. The game contains multiple bonus features including wilds, stacked wilds, diagonal wilds and the Boxing Feature which turns adjacent symbols into wilds for one free spin. An easy game to love, sports fan or not. 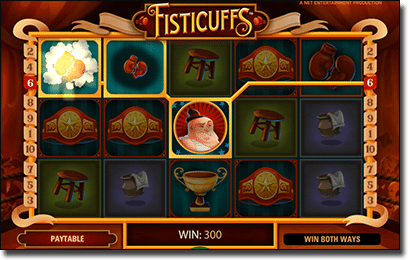 Play Fisticuffs directly over your Web browser at Emu Casino. Football Star is Microgaming’s homage to the beloved English game of football, or as we here Down Under would call it, soccer. This is the first in Microgaming’s sports star collection (followed by Cricket Star and Basketball Star) and set the bar for the format that would be followed. Graphics are a little lacklustre but will appease the soccer fanatics, and the addition of bonus features like scatters, wilds, free spins and the Striking Wild bonus which turns reels wild at random definitely add to its appeal. 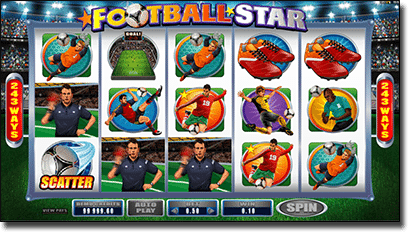 Play Football Star for real bets at All Slots Casino. 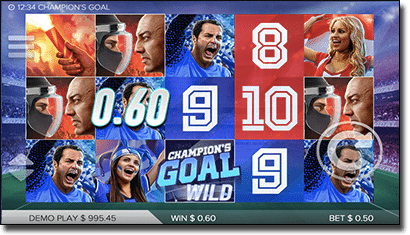 Champion’s Goals is a soccer themed pokies game from NYX Gaming that follows the unique NYX format which allows players to implement betting strategies. You can choose to activate the Jumper, Booster or Leveller betting strategy to allow different ways to form a win. Symbols in Champion’s Goal consist of all things related to a stadium soccer match, complete with athletes, spectators and sporting equipment. The appearance of the lightning fast soccer ball will award a Free Kick where the following win is multiplied X5, and colliding Free Kicks will clear all symbols. An appearance of three symbols from the same team (team blue or team red) triggers the Cascading TIFO bonus which activates three free spins. Play Champion’s Goal and other sport themed pokies at Slots Million. The Roller Derby craze has come back with vengeance over recent years and Microgaming was quick to get on board with this fun, quirky game that celebrates one of the most badass sports of them all. Known for tough chicks on roller-skates rocking tattoos, cool outfits and bruises aplenty, Microgaming’s Roller Derby pokies captures this rock and roll essence perfectly. Watch the reels as roller-skates, referees and spunky roller derby players fly across the screen, with scatters, wilds and free spins waiting around every corner. 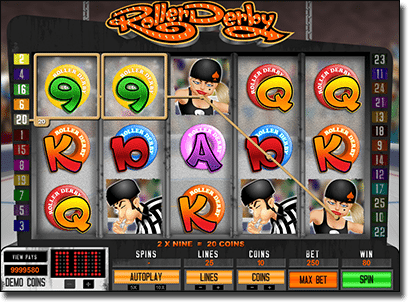 The Lets Talk Derby bonus triggers five free spins where all derby girl symbols on the screen turn into wilds for the possibility of forming some major wins. Get started at Royal Vegas to play Roller Derby. Ready to combine the action of your favourite sport with the excitement of real money pokies? Games can be found at the our top-rated casino sites listed in the table above, which warmly accept players from multiple countries. You can read the detailed casino reviews in our table to find out more about each venue. We recommend checking out Raging Bull Casino, our top-rated casino site for players from United States, which has some excellent welcome bonuses available for new players along with hundreds of real money casino games to choose from, including several sports themed titles.